While the northeast is buried in snow, there is a light at the end of the tunnel. Spring is approaching. Wildflowers in southeastern California are blooming and the conditions are perfect for a so-called super bloom. You may not have heard of a super bloom until now, but it's a real thing and anyone who loves nature should be excited. "Super bloom" is a colloquial term used to describe this abundance of wildflowers that goes well beyond the standard seasonal bloom. It occurs when a number of variables are met. Most importantly, the desert needs quite a bit of precipitation over the winter, preventing the soil from completely drying out. That's what has happened in Anza-Borrego Desert State Park, where the region has seen seven inches of rain since December, according to National Geographic. Anza Borrego is expected to explode with wildflowers during the next couple weeks! Last weekend we climbed up this canyon for sunrise and found the entire top blooming with purple! Go check it out if you can! That's twice the average precipitation the region usually gets in that time period. It's part of an atypically wet winter that is helping California emerge from a prolonged drought. Additionally, in this region, the precipitation has helped awaken wildflower seeds on the desert floor that have waited years without blooming. In addition to dune verbena, the visitors may see desert lilies, yellow desert sunflowers, woolly Indian paintbrush, and the Parish poppy. The peak bloom is expected to last until the end of March. For anyone planning a trip, The San Diego Union-Tribune has a useful guide to seeing the wildflowers. 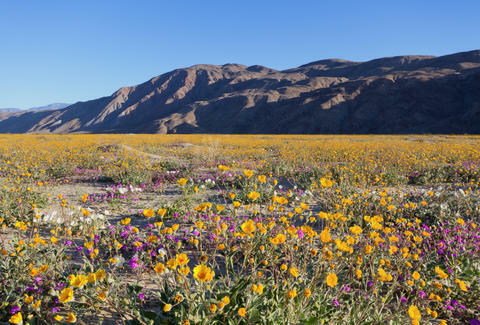 They recommend getting to the desert as soon as possible to experience the super bloom, in case inclement weather or caterpillars disrupt the bloom. They also suggest getting out early in the day to beat the crowds and the heat.